Why ride two bikes when you can both ride a tandem bike together? 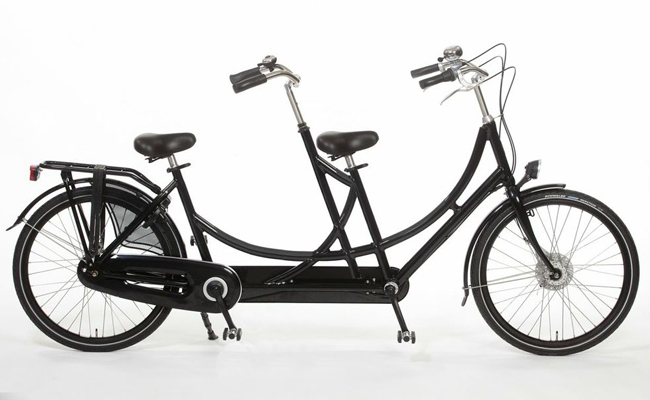 Welcome to Azor‘s ultra strong and durable tandem bicycle – it is built for comfort with its traditional Dutch city bike upright riding – so you can take in the views. Wear regular clothes thanks to its enclosed chain, fenders and coat guard. The included rear carrier can be used to carry your cargo or even your little one by adding a bobike maxi or junior. Lights, bell and Kevlar coated tires included. Best of all, the innovative design means that one can coast while the other pedals.